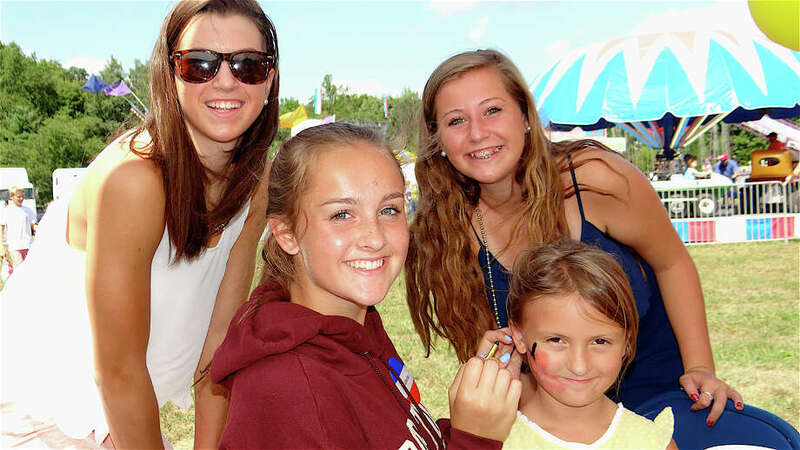 Having a few laughs at the face-painting station at St. Pius X Church's picnic Sunday were Jen O'Neill, Catherine Regan, Caroline Ihlefeld and Katie Freimuth. It was a perfect day for a picnic Sunday afternoon, and St. Pius X Church was hosting the biggest one around. The annual event on the parish's Brookside Drive ground offered a something for everyone. For the kids, there was a small amusements area with rides like the Dragon Wagon, Tubs of Fun, the Sizzler and the Super Slide. There were also crafts, face painting and Sunny the Clown making balloon animals. For grownups, there was a baked goods sale, bingo, tag sale and 50-50 raffle. And everyone enjoyed picnic foods like hot dogs, chicken and fresh corn. Proceeds benefitted Operation Hope of Fairfield.